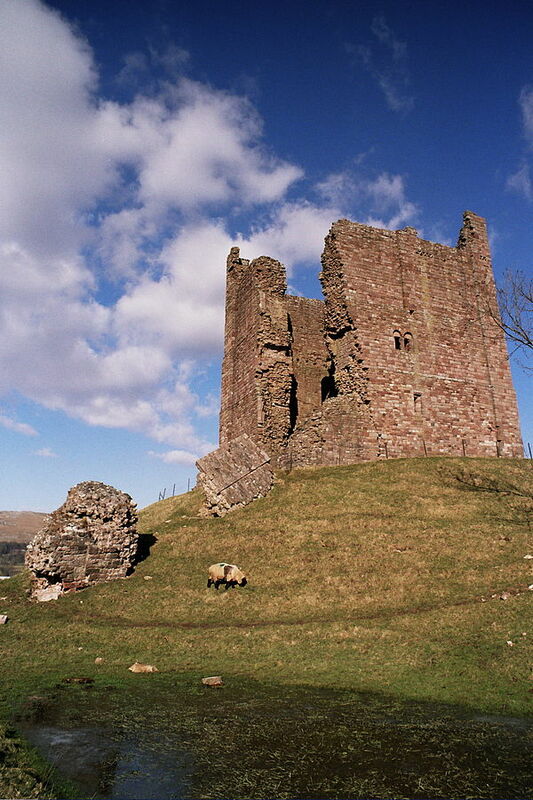 Notes: Brough Castle is a ruined castle in the village of Brough, Cumbria, England. The castle was built by William Rufus around 1092 within the old Roman fort of Verterae to protect a key route through the Pennine mountains. The initial motte and bailey castle was attacked and destroyed by the Scots in 1174 during the Great Revolt against Henry II. Rebuilt after the war, a square keep was constructed and the rest of the castle converted to stone. The Clifford family took possession of Brough after the Second Barons' War in the 1260s; they built Clifford's Tower and undertook a sequence of renovations to the castle, creating a fortification in a typical northern English style. In 1521, however, Henry Clifford held a Christmas feast at the castle, after which a major fire broke out, destroying the property. The castle remained abandoned until Lady Anne Clifford restored the property between 1659 and 1661, using it as one of her northern country homes. In 1666 another fire broke out, once again rendering the castle uninhabitable. Brough Castle went into sharp decline and was stripped first of its fittings and then its stonework. The castle's masonry began to collapse around 1800. In 1921, Brough Castle was given to the state and is now run by English Heritage as a tourist attraction. It is a listed building and a scheduled monument.